First, you will notice that I changed the look of the blog. After two-and-a-half years, I thought it needed a facelift. I think this is a fresher, more modern look. Hopefully you like it. Second, I created an archive of all my old posts, which you can search through here. 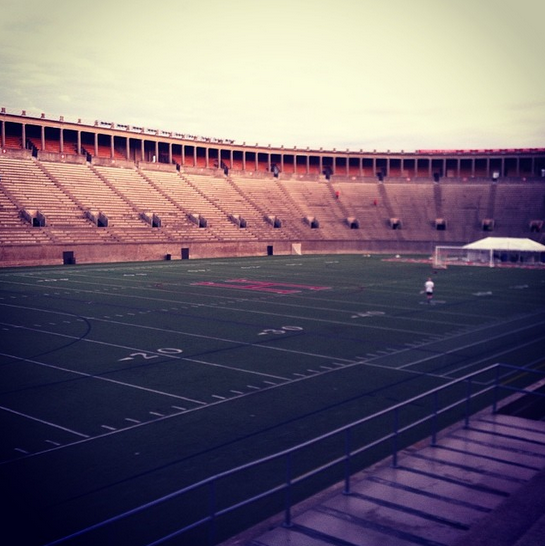 And third – last night I did something I have always wanted to do, which is run the stairs at Harvard Stadium. All of them. I imagine this isn’t how most people would willingly spend a Tuesday night, but it has always been a goal of mine. I am also gearing up for a half marathon on Memorial Day weekend, so I thought it would be a good way to train for that. I love being in an empty stadium. You could feel the history in there. You probably know about the great 1968 Harvard-Yale game, which ended in a 29-29 tie. It is one of the all-time classics – Harvard scored 16 points in the final 42 seconds to tie a highly-touted Yale team that had won 16 straight games. This famously inspired The Harvard Crimson to print the headline: Harvard Beats Yale, 29-29. There are 37 sections, and each section has, oh, thirty steps. The steps are spread out at a wide angle and require long, high strides. It is a tough, demanding workout. There are also smaller steps which are easier to traverse. I alternated between the bigger and smaller steps and by the time I finished my legs felt like spaghetti and I could barely walk. My thigh​s haven’t been this sore since we did, like, an hour of lunges back in 7th grade baseball. Or, even worse, the time we did the inch worm exercise. I’m still sore from that. ​​Well, there is nothing like an endorphin high on a random Tuesday in May. It makes the pain worth it. ​And it makes for a great picture.